Because there aren't enough things in the "To Do" list....but just LOOK how awesome this sweater is, or will be anyway, once it's shortened by about 6-7 inches. Yep, yet another Elizabeth Lavold Viking design. 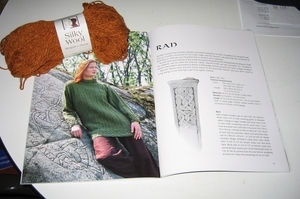 I think I may even do this in the actual suggested yarn - Silky Wool. Shocking. Somehow, this book has "mysteriously" ended up in my collection. Coincidence or fate? And last but not least: Swatching. Always with the swatching around here. I'm slowly making it through the last batch of "test" balls from Knitpicks. This is the Shine Cotton/Modal blend in the color River. Can I say how much I love the way this stuff feels and knits and looks? It's got a nice sheen, has a lot more "give" than other mercerized cotton yarns I've knit, and the color options are quite pretty. 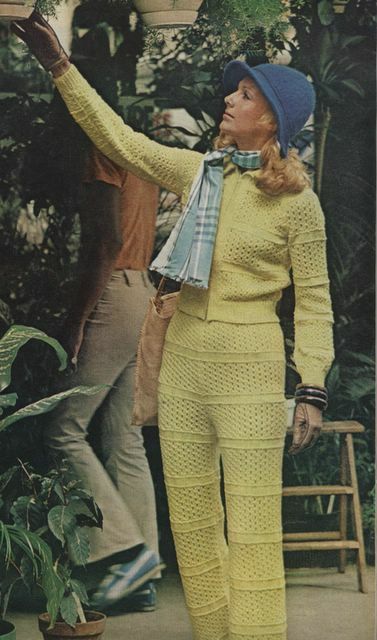 Given my past issues with cotton (yeah, yeah, cotton tank update soon, I hear you), I'm not sure I'd ever try to do a whole adult sweater in this, but I'm betting I could tough it out through some kid knits. And you know how I need some new projects to do, right? ...as we undergo some changes around here. We will work to keep our rubble and detrius out of the way as we completely redesign the layout of our area with NO FREAKING CLUE what we are doing. Now, while that could easily be the start to a fabulously hysterical post about the state of the really tall escalators at my T stop these days (broken. lots of stairs. yuck), it actually isn't. 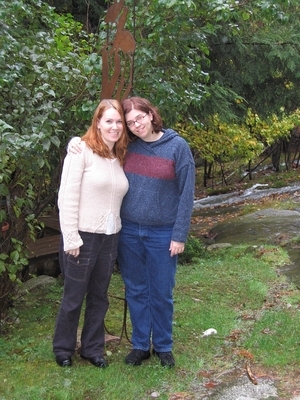 I'm hoping to do some clean up and such here, starting with some new photo albums, etc. which are easy, and ending with a whole new layout, which isn't. Not that it shouldn't be, b/c it's not like Typepad doesn't provide us with a boatload of great interchangable options. No, it's mainly because I insist on reinventing the wheel each and every time I touch this site and also insist on doing all the html edits myself. That could be all cool-geeky-chick, if one were into that sort of thing, except that I've no earthly idea what I'm doing. Not kidding. Anyway it's likely to get REALLY F'ed up around here for a few days, so I'm apologizing now. Er...Sorry. But don't worry, I'm even more impatient than I am ignorant, so it won't be long before I give up and hand it over to someone smarter than me to fix what I've broken. 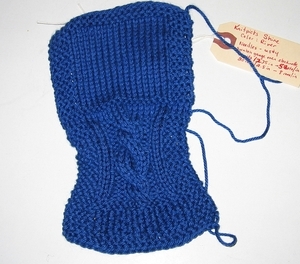 Swatch from Elsebeth Lavold Viking Knits. Just one cable pattern repeat to make sure that a) the boy does actually like it in real life BEFORE I do a bazillion of them up the arms of a sweater I've started for him - in a completely different yarn, but still, (he does) and b)that I could read her charts and make her infernal lifted increases (I can). 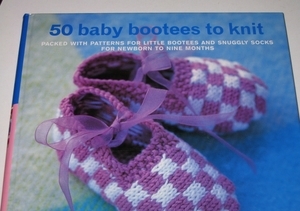 Since I've never knitted from a chart before, this seemed like a moderately good idea. 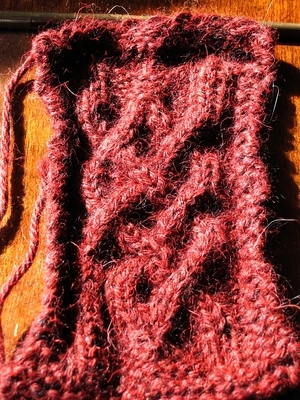 Plus it gave me an excuse to play with this trial skein of KnitPicks Andean Treasure in Embers. You've noticed that have you? The trial skeins in my stash? Yes, I love the trial skeins and the swatching and the learning about different yarns and fibers, etc. A lot. It's fun, it's educational, it's...yeah, ok, it's an excuse to play with yarn without having to make an expensive committment for which neither of us is ready. Ahem...where was I...oh right - lovely stuff this Andean treasure. It shows the cable in real life much, much better than it does here, but it still probably would not be a first choice for a cabled project simply because of the fuzziness. It might, however be in the top 5 on my "throw-it-all-in-a-pile-and-roll-around-on-it-naked" list. Really. Even with the fuzziness. It's got some kind of silk+angora feel to it that I can't figure out but like very much. Neither of these fibers is in the yarn, BTW, just trying to explain the feeling. Also, it seems worth noting that though this photo is fairly accurate to the depth and richness of the actual color (though a little washed out to bring up the cable detail), there was no bleeding when this swatch got washed. That seemed pretty amazing, given how dark it is.